1. 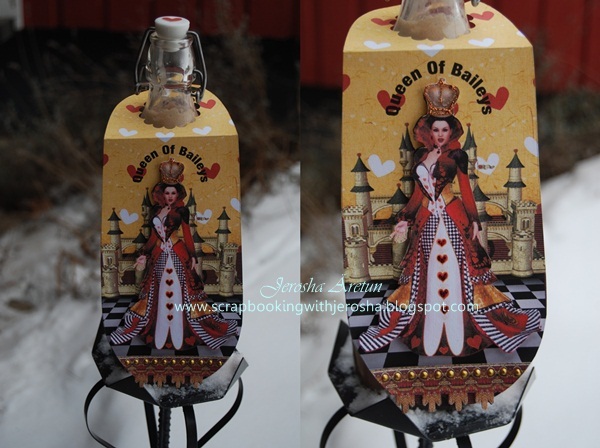 Open your editing software and begin creating a layout from Gemini Creationz Queen of Hearts kit that you want to use and print on a draft mode. 2. To make sure that the placement of elements you chose were in proper places, I suggest you make the templates in transparency so you have an idea how the wine bottle accent will look like. It’s easier to see with transparency before making the final print. 3. When satisfied print your design in high quality mode. 4. Using your transparency accent template, trace and cut. 5. Make a score line on the top side of your cut cardstock and fold. This depends on the size of your bottle. You have to make a fold that will serve as the neck handle of the wine bottle accent. 6. Punch in the middle portion of the folded area using SU scallop punch. 7. Make a slit so it will serve as an opening when you hang the accent. Most bottles have a clean neck and simple cap so after punching there is no need of making a slit. 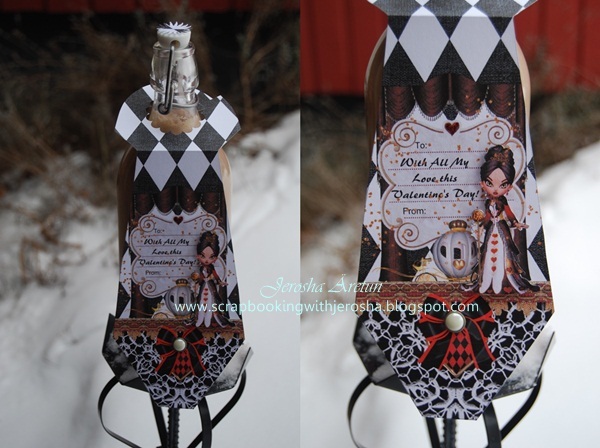 In this project I used IKEA’s 2L bottle and it has a different style of cap. Who doesn’t love Baileys? No one I guess. Baileys has been on top of my list when it comes to something to drink. A sip gives me a different kind of joy that I tend to savour the taste every second of it. The sad part is we all know how pricey it can be. After few tries I was able to make my own Baileys based on my liking and satisfaction. My family and friends have tried it and they say it sure does taste like real Baileys. The best part is it can be kept in your refrigerator for 1 month but I doubt if it will last that long because you’ll never stop drinking this concoction. The recipe here is good to fill 1L of bottle. 1C Cream - I use ordinary whip cream that I find in the grocery store. I have heard about UHT ('ultra heat treated', or 'long life') cream so that their drink lasts longer, but I have learned that UHT cream has a funny taste to it that might not be good to use in a recipe as special as this. 1C Condensed Milk – Forget about evaporated milk because the condensed milk will surely give an extra-rich, creamy taste. If you’re not much into condensed milk, reduce the amount add maple syrup or caramel syrup instead. 1T Instant Coffee – Baileys has a coffee flavour so just mix the granules in a tiny bit of boiling water. Coffee essence is also an alternative if no instant coffee is available. 1T Vanilla – To have a vanilla flavour use extract and not flavouring. 2T Choco Syrup – Use chocolate syrup like Hershey’s or any brand available in your supermarket. Whiskey – An Irish whiskey is a must. It doesn’t have to be the most expensive bottle since the taste will be softened by the cream. Combine all ingredients in a blender and set on high speed for 30 seconds and no more. If you blend it too long, the cream will thicken and you will end up eating a dessert instead of having a great drink. Bottle in a tightly sealed container and refrigerate. Shake before using and serve with ice. Note: To make a mint flavoured drink, dribble in a little creme de menthe or peppermint essence. To have an almond flavour Baileys, add few drops of Almond extract. Bitter Almond drops can also be used but not more than a drop. Project Life Orders : Delivered, Yippee!!! Pre-start of My Project Life!